Concepts of Database Management 7 Edition CONCEPTS OF DATABASE MANAGEMENT fits perfectly into any introductory database course for information systems, business or CIS programs. This concise text teaches SQL in a database-neutral environment with all major topics being covered, including E-R diagrams, normalization, and database design. 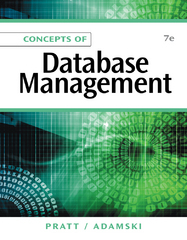 Now in its seventh edition, CONCEPTS OF DATABASE MANAGEMENT prepares students for success in their field using real-world cases addressing current issues such as database design, data integrity, concurrent updates, and data security. Special features include detailed coverage of the relational model (including QBE and SQL), normalization and views, database design, database administration and management, and more. Advanced topics covered include distributed databases, data warehouses, stored procedures, triggers, data macros, and Web databases.